This time we’re looking at a short track, because “On The News” is just a piece of source music. The music starts like a news broadcast with a bass drum pulse, fast hi-hats, brass and strings in unison and a synthesizer which is subtle but effective enough to give it a contemporary, less orchestral sound. 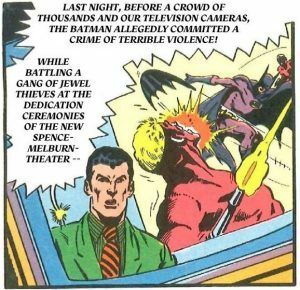 After the headline is over, the music is reduced to rhythmic elements and bass line, with a slightly dissonant string pad emphasizing the public plea of the news anchor for Batman to surrender to the police. The music ends abruptly as commissioner Gordon shuts off the TV.